I updated the blog “Oh, It’s All About The Books, ‘Bout The Books, ‘Bout the Books” to include favorite reads that have come in the last few days. Here are comments that were included with the books listed, carrots to get thee to the library, the Kindle, the independent bookstore. Any murder mystery by Anne Perry including The Thomas Pitt series: You never know who dunnit until last 5 or 4 pages, then you have to go back and re-read them just to make sure. Informative about life in England mid 1800s on. You don’t necessarily have to read them in order. Being Mortal by Atul Gawande : Nonfiction; medical / end-of-life issues. Best book I’ve ever read on this subject! Evidence of Things Unseen by Marianne Wiggins: Fascinating and beautiful novel set partly in Knoxville/ Oak Ridge. This is a book I’d never want to miss; best novel I’ve read this year; superb writing. She breaks the rules but does it expertly. Barefoot to Avalon by David Payne: This memoir is exceptional–the best memoir I’ve read this year, along with Amy Tan’s The Opposite of Fate. But of the two, if you have to choose, don’t miss this one. Incredibly honest and engaging from Page 1 to the end. Hellhole by Gina Damico:. Max accidentally opens a hole to hell from which a Demon named Burg crawls out. Listening to this story REALLY makes it even more awesome. Fairest by Marissa Meyer: This is a sort of prequel to the Lunar Chronicles where we learn about the early life of ultimate bad guy Queen Levana (truly, read the other 3 books first). You know how sometimes, you feel empathetic to the bad guy because of how she/he grew up? You think you might find that with Levana…. Meyer’s series contains such an artistic web of storylines. The Light Between Oceans by M.L. Stedman: Gorgeous writing and story and completely heartbreaking. All the Light We Cannot See by Anthony Doerr: Masterful storytelling and beautiful writing and story. Trampoline by Robert Gipe: Hilarious, lyrical, and heartbreaking all at once. Tennessee boy (now in Harlan) done good. As Venice braces for a winter storm and rising water, Commissario Guido Brunetti finds out that an old friend has been savagely beaten at the palazzo home of her lover, the reigning diva Flavia Petrelli. (This one also involves the forgery of rare Chinese porcelain). In Brunetti’s Cookbook, Donna Leon’s best friend and favorite cook brings to life these fabulous Venetian meals. The recipes are joined by excerpts from the novels, four-color illustrations, and six original essays by Donna Leon on food and life in Venice. The Girls of Atomic City by Denise Kiernan: History of several women who worked at Oak Ridge/ Secret City from 1942-1945. I suggest this read for everyone who lives in Knoxville. Lot of history. The Given Day by Dennis Lehane: This is a story of three individuals from across the states. A baseball player, factory worker and a police officer. How their paths cross. Some history mixed with fiction. Good read. The Brass Verdict by Mitch Connelly Thriller about how an attorney catches the bad guys using private investigators and police. October 19: I updated this page, adding some late arrivals. I asked about 45 people if they would let me know 3 of their favorite reads of the year and 31 responded to my request. Some cheated and tried to add more than three–those will be mentioned in another blog. There were 3 repeats of titles, All The Light We Cannot See (4 readers), The Invention of Wings (2 readers), and Boys in the Boat (2 readers); those I listed only one time. 26 females and 5 males responded. Ages ranged from 15 to 70s. Comments that came with books will be in another blog. If you didn’t respond yet and would like to, you can add your choices as a comment. 62. The Girls of Atomic City by Denise Kiernan. 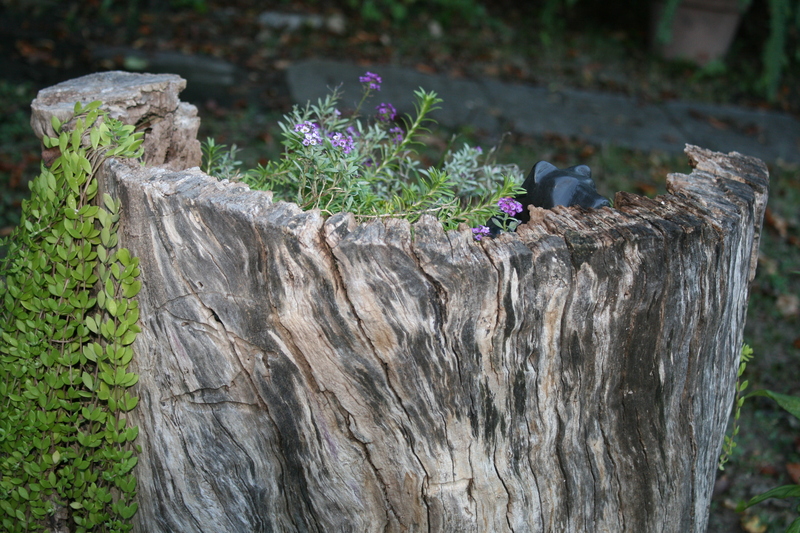 When I moved into the house on Emerald Avenue over three years ago, I really did not like the tall tree stump in the front yard. Centered near the front porch at that point it was bare and the only “tree” in the yard. 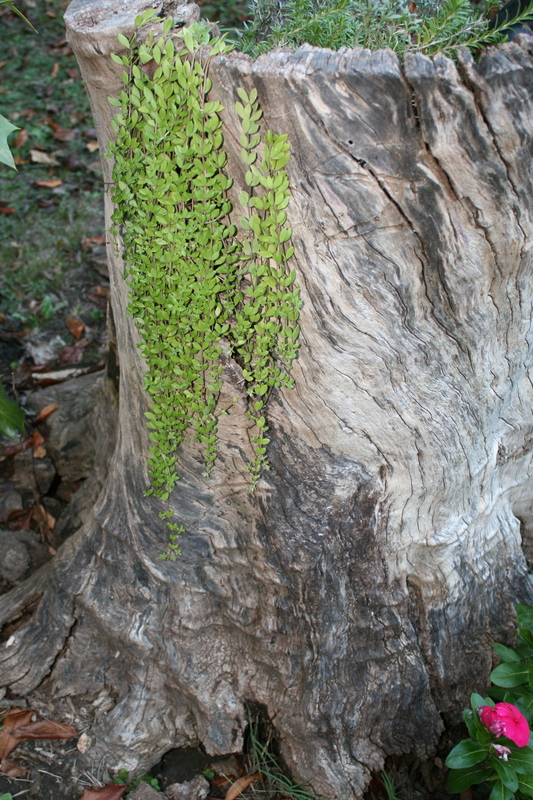 Because I do love our front porch, I found myself staring at the stump often. 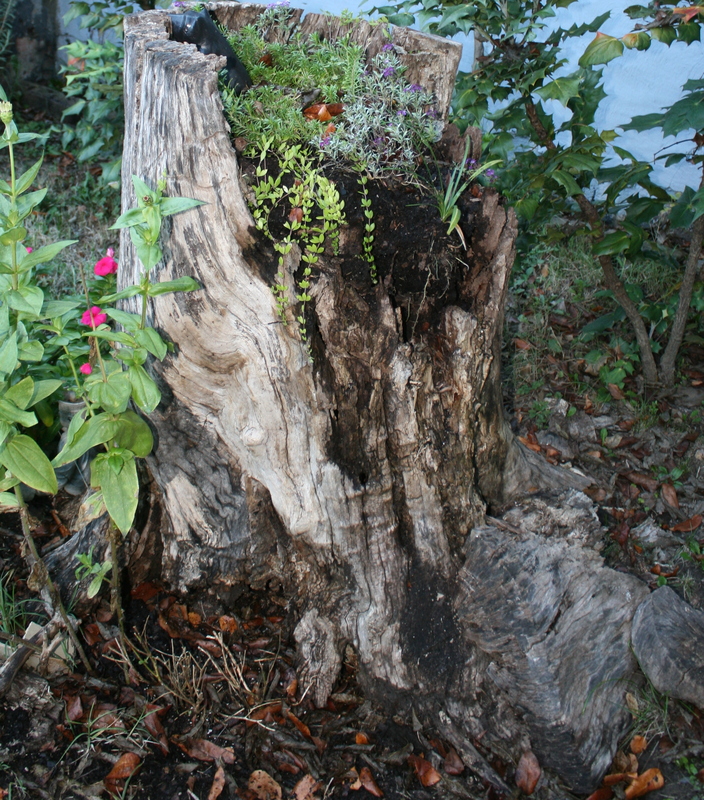 As the yard became more personal with shrubs, flowers and a bird bath, the stump took on an aurora of its own. I filled it with dirt and planted sweet-william and phlox and ground cover. Around the base potted ferns sat, later replaced by flower seeds and even snow pea plants. 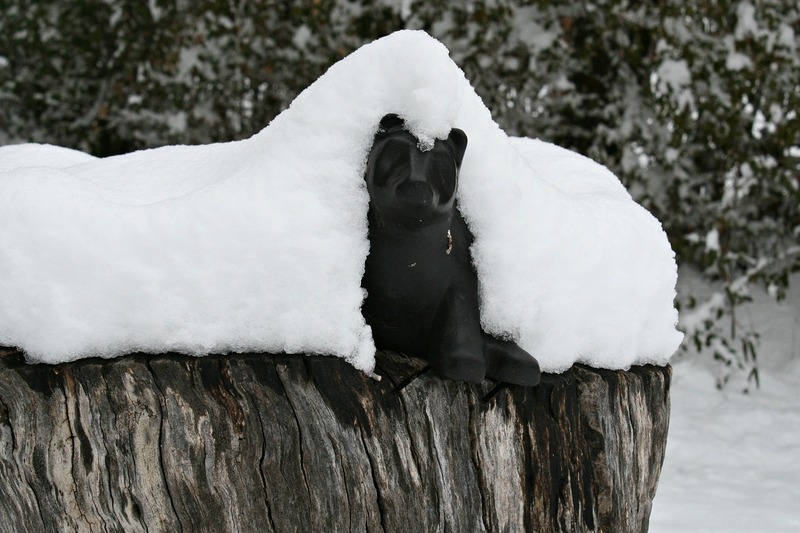 I added my black bear (model for the painted bears of downtown some years ago). He has stayed his post through all kinds of weather. Now he is sinking fast for the stump is in decay. The back side has broken off. The dirt and plants inside are in danger of losing their grip. What I first thought was ugly and an eye sore I now treasure. The patterns in the wood are detailed and full of character. 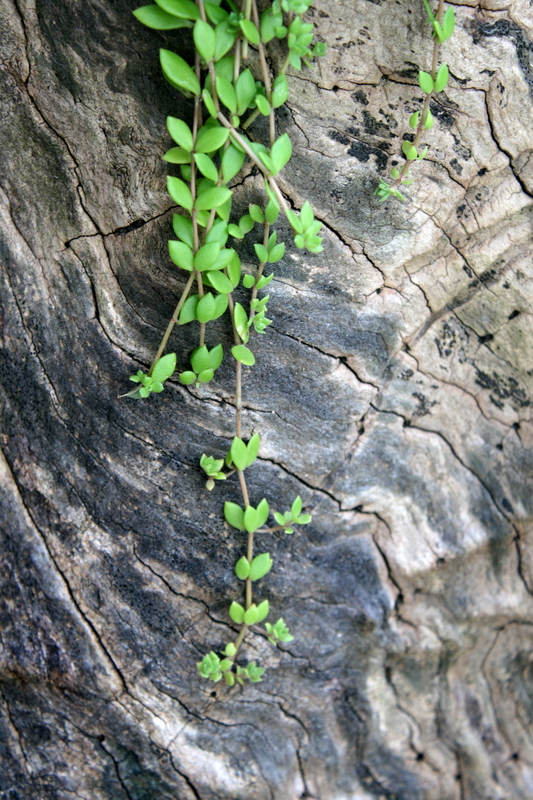 It is soothing to study the swirls, cracks and textures. Time and awareness sometimes change first impressions. I hate to think of the front yard without the stump. Oh me. Do young girls keep paper diaries today? It was a different world in 1955–square dancing, liking cafeteria food, caroling–but I bet the emotions are close, even today, 60 years later. P.S. This was in September and he gave me a box of candy for Christmas.